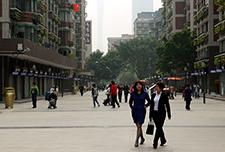 In the 1970s and 1980s, workers from the same work unit, or danwei, frequently lived together in housing provided by their employer, called ‘danwei’ housing estates. 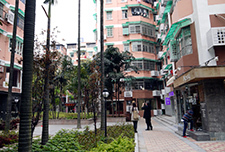 Most other housing in the city was built by the municipality or by other branches of the government. 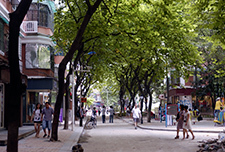 Built before the automobile profoundly changed the layout of cities, these older housing estates rarely included parking for private cars, and sometimes had nice public spaces. 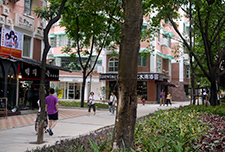 Today, there remains a large stock of housing in the 'danwei' estates. 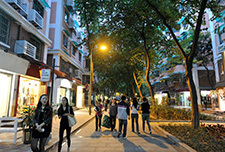 Liuyun Xiaoqu is an example of how one such housing estate was improved. 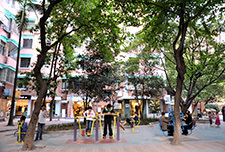 Initially, the Liuyun community was a gated single-use residential block typical of the housing estates built in the past. 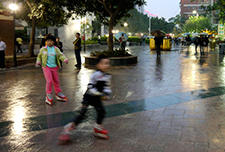 When the nearby Tianhe Stadium was built for the National Games in 1987, the Tianhe District Government built Liuyun Xiaoqu to develop the area and to provide housing for people that were relocated. 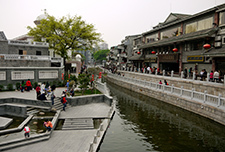 The housing stock was generally better than older similar ‘danwei’ housing, but the area was gated, severing connections to nearby communities, and the single use zoning meant that residents had to walk considerable distances to reach the nearest shops. 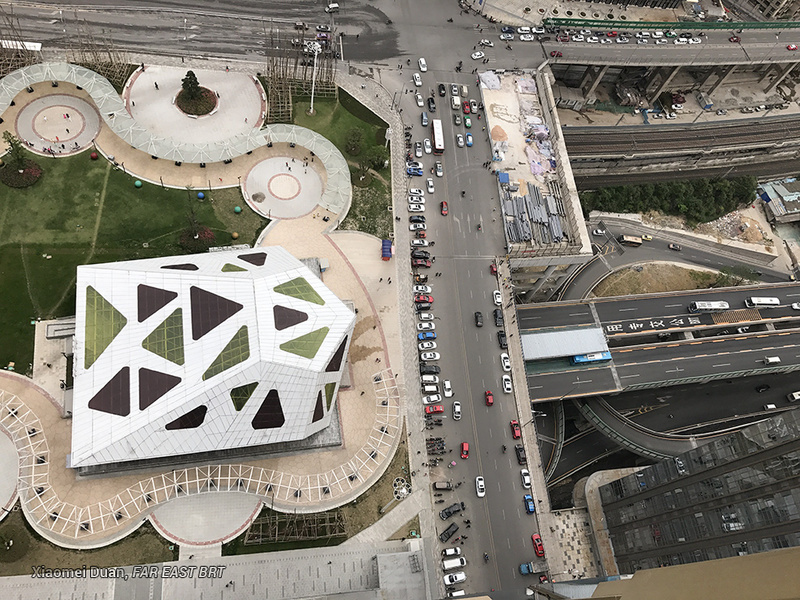 As it was built before motorization took off in China, it had very little parking. 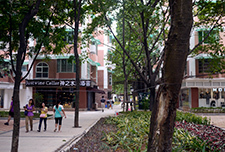 The variety of 8 and 9 story buildings left about 70% of the land as open space which was devoted to pedestrian spaces and landscaping. 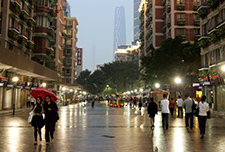 The building form follows the pattern of streets, creating lively and well-defined streets. 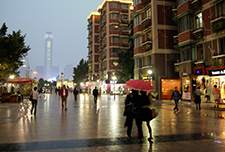 Starting in about 2000, the tenants in the buildings gained the title to their apartments. 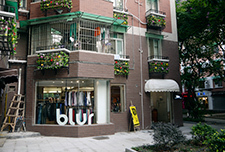 The owners of the ground floor apartments then realized they could make a living by converting their premises to commercial uses, at first for local shops and later for designer clothes and cafes. 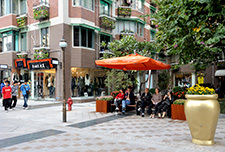 The ground floor conversions occurred in waves, starting nearest Tianhe Plaza and eventually converting nearly all the ground floors to commercial use, turning the area into an open, mixed use neighborhood. 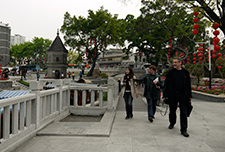 With much of the area now commercial, the former gates were taken down and its narrow pedestrian passages were opened up to public access. 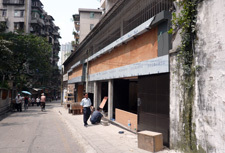 Parking that had come to occupy some of the small alleys was removed. 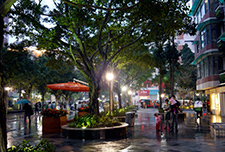 In the lead up to the 2010 Asia Games, due to proximity to key sporting venues, the municipality improved the utilities and infrastructure, the pedestrian areas and landscaping, and added some pastiche architectural ornamentation. 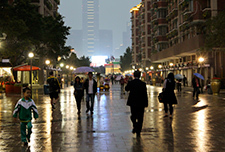 Real estate prices increased by 20% in the six months after the improvements were made. 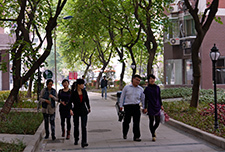 Click here for more photos of Liuyun Xiaoqu. 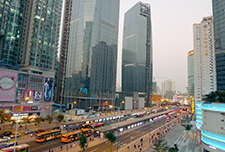 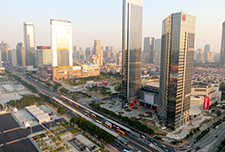 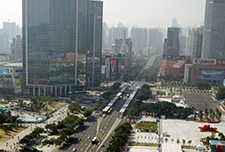 Liuyun Xiaoqu is located south of Tiyu Zhongxin BRT station and the large Teem Mall shopping centre, in the right-background of this photo. 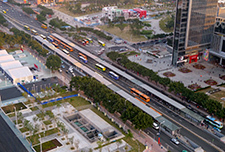 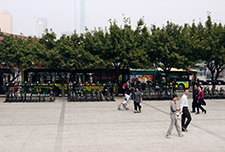 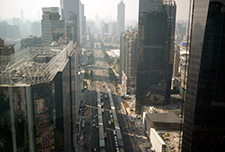 A linear park which opened in November 2010 (middle of photo) connects the BRT station to Liuyun Xiaoqu’s pedestrianized spine.